It’s a fascinating model to try and apply, but there is one fundamental difference between the locavore food movement and devolving news to local producers. In the former, the process is inherently scientific and objective — soil nutrients, water, photosynthesis, etc… are all systems that can be easily followed, are respected and recognized by the majority of gardeners, and produces tangible results. In the latter, the process is inherently subjective, and more akin to gossiping. We do not (at this time) have a shared culture that believes in withholding judgement, seeking understanding in preference to jumping to a conclusion, or confirming facts. 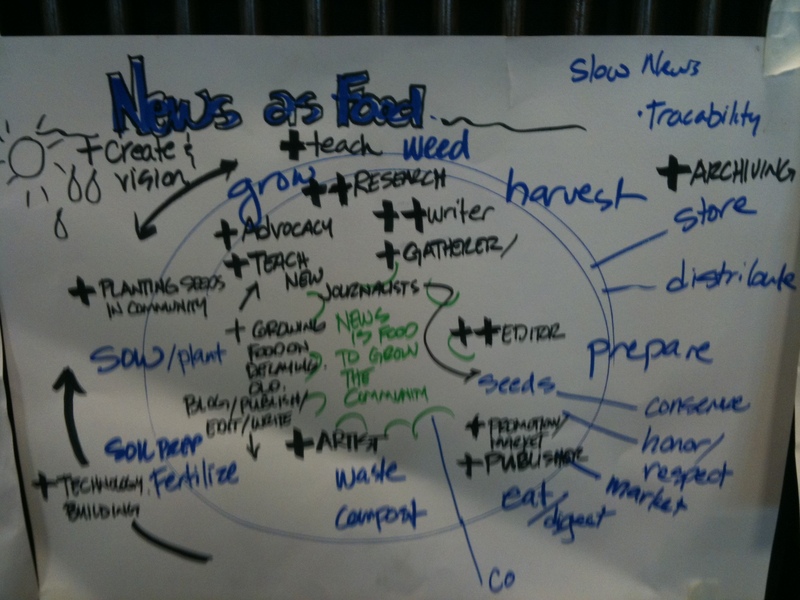 To put it another way, gardening and food movements are methodical, while storytelling is not. Hi Alexander thanks for your thoughts. As a gardener and journalist, I think gardening is more subjective than you’ve made it out to be. Oftentimes many other complexities, slope of the land, neighboring plants and trees, site location, air pollution and other factors make gardening a trial-and-error process. Or let’s say food production/gardening are sensitive to “hyperlocal” conditions! In addition, the slow news model could have some form of “local producer” e.g. citizen journalist involved in the process, just as we have citizen scientists and astronomers. They would be akin to the local agricultural extension agent who is very familiar with the hyperlocal growing space. Storytelling is a subjective process, but the cultivation of stories, their distribution, and their production need not be so.